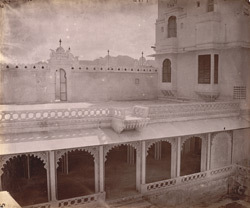 Photograph of a colonnade in a court of the City Palace, Udaipur, taken by O.S. Baudesson in 1882, from the Archaeological Survey of India Collections. Udaipur was founded by Udai Singh (r.1567-72) in the mid-16th century as the fourth and last capital of the Mewar kingdom, and is situated in a valley containing three lakes: Lake Pichola, the Fateh Sagar and the Umaid Sagar. The City Palace, begun by Udai Singh and continued into the 18th century, is built on the east bank of Lake Pichola and contains many courts and apartments on different levels. This view shows a balustraded colonnade with steps down to the court, and a walled terrace above. The colonnade has cusped arches with painted floral decoration in the Mughal style.